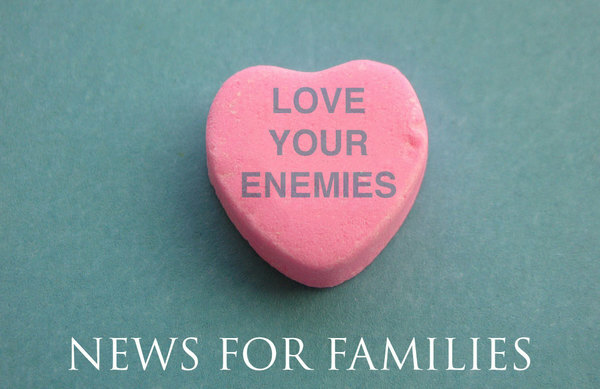 How interesting that the Sunday immediately after Valentine's Day, the Gospel text features Jesus calling us to love our enemies? Let's be real: Life includes people who we don't like, who don't like us, who are mean to us, who hurt us, or who we just don't get along with easily. That's true for adults and kids. Part of life is learning how to cope with these people. But Jesus call us to go even further than that. Love your enemies, he says. This Sunday we'll explore how we can achieve that kind of love, and why it matters. Join us at Sunday School meeting at 10:05am in the sanctuary. Our next Confirmation Class is Saturday, March 11 from 9am-12pm, where we'll begin exploring the Apostle's Creed and continue further in our "Papa Luther" comic books. I also look forward to seeing Confirmation students read at the "Here We Stand (And Sing!)" Reformation Hymn Sing at 7pm on Wednesday, February 22. Join us for our special Youth Group event on Friday, March 3 from 7-9:30pm, co-sponsored by Pinecrest youth leadership ministry! With Pinecrest's "Refugee Simulation" activity designed for youth, plus the opportunity to connect with new inspiring leaders, new leadership opportunities, and new Lutheran friends from throughout the NYC Metro area -- this special event is one you do not want to miss! This is going to be awesome. Come join us for this special night of fun, learning, and fellowship. As I write this, Valentine's Day is tomorrow, and I am hoping all of you and your family members have felt loved by family, friends, partners, and community this week. And, of course, let's not forget the unconditional love we have abundantly from God. Let us continue to remember and share that love, even as the chocolates are eaten up and the cards stored away, because it is eternally with you.